Linguistic Note: Japanese uke, food, plus mochi, she who possesses. Description: Goddess of fertility and the substances that sustain life; Provider of rice from flat-lands, sea-weed and fish from the sea, game creatures from the mountains; through Her death She sustains life. To Whom Sacred: panic grass; cultivated rice-plant and the cooked grain; wheat; millet; beans; cattle; silkworms; horse. Male Associate: Inari, ----. She is sometimes confused with him. One of the alternate meanings of Hindu Annapurna's name is Possessor-of-Food. Interestingly similar to the meaing of Uke-Mochi-No-Kami's name. 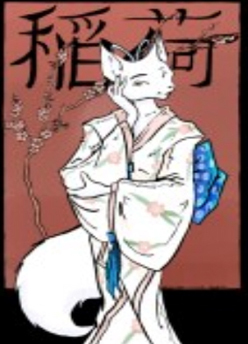 She is sometimes confused with Inari, ----, below. Uke-Mochi-No-Kami is also called Toyo-Uke-Byme, TOYO-WKA-BYMA, Princess-of-Rich-Food. Also called: Waka-Uke-Nome, U*K*,WKA-NOMA, The-Young-Woman-with-Food. Source: DWM 106; JM.JP 19; MAW 424; New Larousse EM 417. Description: Shapeshifting Shehe of rice; Guardian of rice-crops; Shehe Who descends from Eris mountain home in spring and returns in autumn; Tutelary deity of swordsmiths and traders. Usually concieved of as male, Shehe is sometimes confused with Uke-Mochi-No-Kami, She-Who-Possesses-Food, above. worked on: December 1995; July 1991; July 1990.